Home » natural remedies » Trouble Sleeping? Detoxing? Try Epsom Salts! 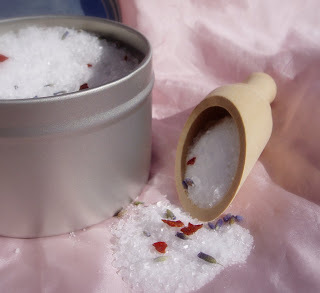 Epsom salt baths is another natural remedy that costs little, and is the salts are found at just about any drug store. Most of us have heard of them, but until last summer I wasn't sure what exactly they were used for. Then a friend who shares a lot of her health related research with me suggested that I try supplementing my one of my children with magnesium. Being wary of supplements, I saw that you can get magnesium through an epsom salt bath instead of orally, so the next time I was at Walmart I bought a container of epsom salts and dumped the whole 2 cups or so into her bath. I don't remember exactly what we were trying it out for, but I do remember that night was the first time she slept through the night in nearly 3 years. I had thought she was just a light sleeper, and I just kept her in our room and helped her fall asleep and go back to sleep by patting her back every night. But when she gets her baths, she sleeps so much more soundly and goes to sleep so much more easily. I'm sure this isn't the answer to everyone's sleep issues, but it worked really well for hers! I asked her doctor if she could overdose, and the doctor replied that she wouldn't overdose by absorbing too much through her skin. So I feel comfortable with the baths. If someone was really sensitive, it looks like the first sign of overdose would be diarrhea. It's always good to look at the criticisms of any treatment you're going to try, especially long term. It's advised to stay away from Epsom salts if you have kidney disease, or have a restricted salt intake. I think in the Gerson Therapy book (cancer treatment through diet) he strongly advises against even touching Epsom salts during therapy. Dead Sea Salts (our health food store has them in the bulk bin- that's what's pictured above, with lavender and rose hips) are supposed to be high in magnesium as well. Epsom salts, or dead sea salts, at the least are a nice natural bath additive. Add in couple drops of your favorite essential oil and you're good to go, and may even detox or supplement at the same time! Have you noticed Epsom salts working visibly in someone you know? 0 Response to "Trouble Sleeping? Detoxing? Try Epsom Salts!"